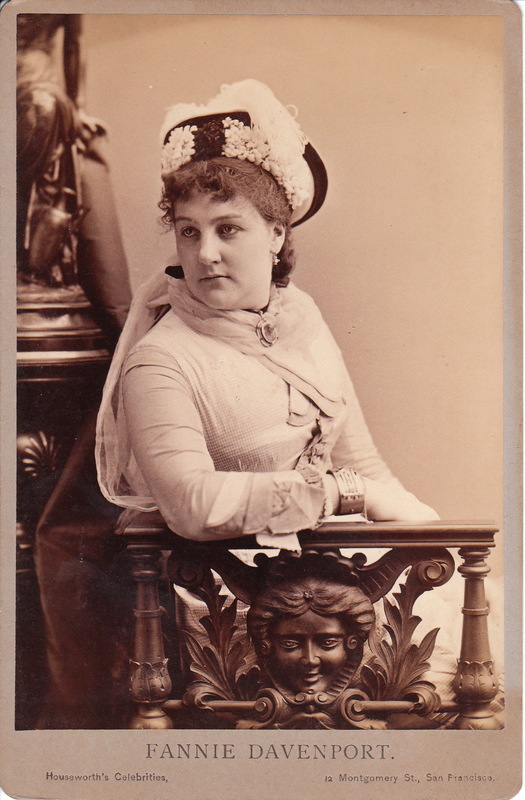 The top Cabinet Card is an image of American stage actress, Fanny Davenport. The photograph is dated February 28, 1880. Miss Davenport (1850-1898) was thirty years of age when she sat for this photograph by Emil Scholl, in Philadelphia, Pennsylvania. He photographed many celebrities and this site has a category that includes a number of his images. To view these images, click on the category “Photographer: Scholl”. Davenport was born in London, England and educated in public schools in Boston, Massachusetts. In 1862 she appeared in ” Faint Heart Never Won Fair Lady” in New York. In 1869 she became a member of the Augustin Daly Theater Company. She later formed her own company. She had great success in “Fedora” (1883) and “Cleopatra” (1890). Fellow actor, Otis Skinner, in a backhanded compliment stated that “Miss Davenport was a handsome woman, her business sense keen and her industry untiring. 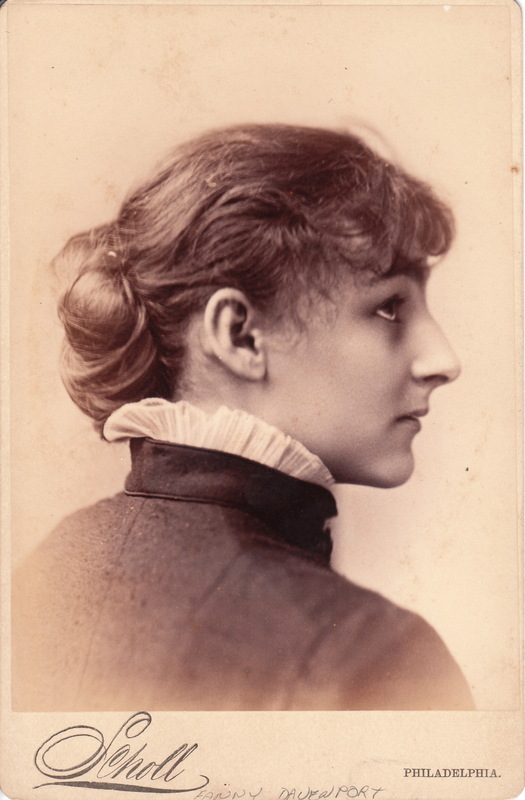 To these qualities rather than her acting, she owed the late success in which she accumulated a fortune in her productions.” The second photograph features a portrait of Davenport by Thomas Houseworth, whose studio was located in San Francisco, California. This image was part of the “Houseworth Celebrities” series. The series included three thousand titles for different categories, including entertainment and government. Note the carving below the chairs armrest in this photograph. Also take notice of Miss Davenport’s interesting hat. Thomas Houseworth (1828-1915) was an optician, photographer, and photographic publisher. Houseworth and George S. Lawrence came to San Francisco in 1849, during the Gold Rush. They caught gold fever and worked as miners in Calavera and Trinity counties. After two years of mining, they admitted defeat, and returned to San Francisco. In 1855, they partnered in a store that sold optical supplies and other miscellaneous items; but the partners became most well known for their stereographs. In 1859 they sold stereographs from an English company, but they soon contracted with local photographers to acquire and publish a diverse collection of stereos featuring various aspects and scenery of northern California and western Nevada. Later, they began to publish and market stereographs under their own name and by the early 1860’s had built the largest collection of stereographs for sale on the west coast. Lawrence retired in 1868 and the firm became known as Thomas Houseworth and Company. Houseworth hired the most talented photographers he could find. His photographers included Thomas Hart (Transcontinental Railroad Construction), Carleton Watkins (The Sierras’), and Eadweard Muybridge (Yosemite). By the 1870’s Houseworth’s business was failing due to increased competition. He left the field of photography in the 1880’s and went to work as an accountant and an optometrist.